Measure flour, baking powder, baking soda, salt, sour cream and milk into bowl. Stir lightly until combined, adding a little more milk if needed to hold dry ingredients together. Flour bread board lightly and push dough onto it. Flour hands and knead gently 8-10 times. Pat dough out until it is about 1/2" to 3/4" thick. Cut with floured biscuit cutter and place on ungreased baking sheet. Bake about 8 minutes until golden brown. Remove from pan to cooling rack. Yield: 11-12 biscuits, depending on diameter of cutter. Chili con Carne - Stove Top or Crock Pot! Made them this a.m. Yum. I just tried this recipe and it is amazing. 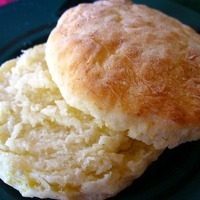 I've never been able to find a light flaky biscuit recipe that didn't have shortening and butter. These bicuits were delicious!! Knead very lightly over kneading will make them tough. I didn't roll them out just took small handfulls rolled in a ball then flattened out a little. Don't use light sour cream, they won't taste the same. Cant wait to try this recipe !! I haven't tried this yet ,but would love to make a low fat version. This recipe is fantastic!! The best biscuits I've ever had. I would not use light sour cream. I didn't roll them just rolled handfull of dough in balls and placed on cookie sheet and flattened a little with my fingers. The less you handle the dough the more flaky they will be. These biscuits are really delicious. Instead of salt I added garlic powder to help reduce sodium content. Thanks for your review Gracie, and I like your suggestions to make them healthier and easier to prepare. So nice.. would be cool to try. I use all-purppose unbleached flour. Yes I have cut them too with a sharp knife, which cuts them cleaner without depressing the sides as a glass does. But I always remember mom using a glass in a pinch to cut out biscuits and there's such a variety of sizes that way too. I hope you like trying them out. So much tastier than store bought. WOW! I cant wait to try these. Did you use White Lily flour. That is all I use for my biscuits. Next time I make biscuits I will try it with sour cream. I also cut my biscuits because I can never find my cutters. Sometimes I use a glass.